The Comfort Zone CZ700T 20 inch high velocity floor fan delivers cooling and ventilation and is easy to use. No installation or mounting is needed, making setup as easy as plugging it in and turning it on. The CZ700T 20 inch high velocity floor fan can be used in noise-sensitive environments because it features quiet operation. Comfort Zone CZ700T 20 inch high velocity floor fan features a power switch that also adjusts between the 3 fan speed settings. 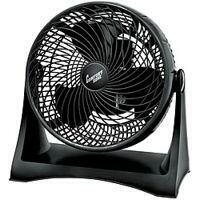 The CZ700T 20 inch high velocity floor fan is completely made of plastic for a lightweight design. This high velocity floor fan can rotate all the way around with an adjustable tilt stand. The Comfort Zone CZ700T has the ability to tilt up to 180 degrees to provide ventilation and cooling in multiple directions.